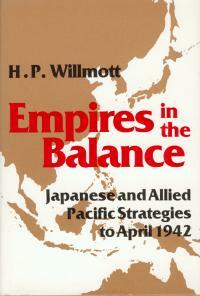 Book Review "Empires In The Balance"
"Empires in the Balance", subtitled "Japanese and Allied Pacific Strategies to April 1942" by author H. P. Willmott (Orbis Publishing, London), published in the United States by the Naval Institute Press, Annapolis, Maryland (1982). Hardbound, with dust cover, it retails for roughly $30.00, and has ISBN# 0-85613-428-7. It is not currently in print, but available through book searches. Antony Preston, former editor of Warship Quarterly and himself author of many authoritative books on naval affairs, says of this book, "A well researched and well written book. Books about what went wrong in the Far East are common enough but there are very few available...that examine the Japanese viewpoint so fairly...It is a description of a successful campaign, not an apology for British and American defeats. There is nothing quite like it in print." Indeed, these early months of WW II are replete with Japanese successes, often taken with great risk and great determination, but reaping great rewards. Willmott goes into great detail for the Malayan campaign that spelled the end of the British foothold of empire in Asia. The Dutch empire, too remotely tied to a captive nation in Europe, also fell before the efficiency of Japanese conquest. The story of the fall of the American outpost of empire, the Philippines, is told in somewhat lesser detail. More telling of the chances for a successful Japanese Empire is the book's analysis of the origins of the Imperial yearnings from the late 1800's, origins of the deterioration of Western psychological and military holds on the East Asian region, and the options of conquest and defense available to the Japanese once their sought-after empire was achieved. The near-impossible quandry of how to keep America's military might from challenging and overwhelming the Japanese Empire is interwoven continually with the stories of Japanese miscalculations and misinterpretaions of their own, and America's, abilities to wage a successful war. Willmott's book shows us the mindset of the Japanese and how it could rally their nation to the cause of Empire through war, and come to be their own downfall. This book holds a prize place in my extensive bookshelf.